The Royal Oak Offshore needs no introduction. An extreme version of the legendary Royal Oak, the quintessential sports watch that has become an Audemars Piguet icon, this superlative line of timepieces embodies the talent and inventiveness that the Manufacture has dedicated to serving aesthetics and performance. Successively associated with some of the greatest Formula 1 racing drivers, such as Rubens Barrichello and Juan Pablo Montoya, it is now issued in an exceptional new limited series bearing the signature of Jarno Trulli. Celebrating the partnership established between Audemars Piguet and the Italian champion in 2008, the new Royal Oak Offshore Jarno Trulli Chronograph embodies the values shared by the racing driver and the Manufacture: a passion for perfection and precision, coupled with an obstinate determination to maintain high standards. For Jarno Trulli, these values are conveyed through the excellence he displays in his career as a racing driver, a daily experience that leaves no room for rough estimates, but is instead governed by the rigorous precision that makes all the difference. These same values are also manifested in Jarno Trulli’s other passion for vineyards and making his own wine, a task that calls for patience, experience and humility – all qualities closely resembling those exercised by a master watchmaker at his workbench. For Audemars Piguet, this close sense of kinship now fi nds a fresh form of expression in the Royal Oak Offshore Jarno Trulli Chronograph. Loyal to the tradition of frequently associating this collection with the world of motor sports, the Royal Oak Offshore Jarno Trulli Chronograph combines a highly innovative exterior with a remarkable chronograph movement. 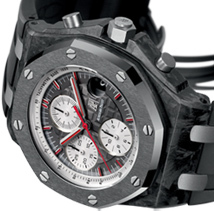 Its 42 mmdiameter case, which is water-resistant to 100 metres, is composed of innovative materials including forged carbon, which Audemars Piguet was the fi rst to master and to introduce into haute horlogerie. The amazingly light middle is made from 12.5 grams of carbon fi bres compressed at pressures of more than 300 kg/cm2 and measuring a total of 100 km in length! For the famous octagonal bezel – the part of the watch most exposed to impacts – the brand has opted for Cermet, a material notably used in creating the space shuttle heat shield. A contraction of the words “ceramics” and “metal”, this composite material combines the fi nest qualities of the two materials: extreme hardness of 1,450 Vickers as well as resistance to shocks, extreme temperatures and corrosion. model. These vivid touches endow it with an aura of controlled power very much like that of a high-powered racing car revving up on the starting grid. 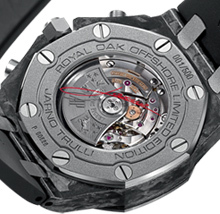 The “engine” of the Royal Oak Offshore Jarno Trulli Chronograph is in the same vein as its bodywork. Visible through the transparent caseback, the mechanical selfwinding 3126/3840 movement, based on Manufacture Audemars Piguet Calibre 3120, makes it a formidably accurate measuring instrument. 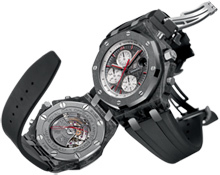 Its reliability and its performances stem in particular from a variable-inertia balance fi tted with eight inertia-blocks and a cross-through bridge; while its user-friendliness is guaranteed by a fast-adjustment instant-jump calendar, a 60-hour power reserve and a time-setting mechanism equipped with a stop seconds device. The impeccable technology of Calibre 3126/3840 is admirably matched by its fi nishing. Audemars Piguet is indeed a benchmark in the fi eld of movement decoration, and this entirely hand-assembled movement is no exception to the rule. The chamfering, polishing and Côtes de Genève on the bridges, and the circular-graining on both sides of the mainplate, are all meticulously executed by hand. The 22-carat gold oscillating weight is galvanic coated to give it the same modern touch as the watch as a whole, and it also bears the heraldic crests of Audemars Piguet’s founding families. The latest edition to the Royal Oak Offshore collection is secured fi rmly to the wrist with a black rubber strap and a sand-blasted titanium folding clasp. · Finishing: all parts meticulously decorated: mainplate circular-grained; bridges rhodium plated, chamfered,snailed and adorned with Côtes de Genève motif. Diamond-polished jewel sinks, diamondpolished sinks and chamfered spokes on the wheels; chamfered screw rims and slots. 22-carat gold oscillating weight with anthracite grey galvanic coating. · Anthracite grey with exclusive “Méga Tapisserie” motif, silvered counters, applied hour-markers and hands in white gold with red luminescent coating, silvered inner bezel ring.